Happy New Year! I know it’s rather late. Perhaps I should say: Belated New Year Greetings? I have really MISSED all my blogging buddies. I decided to take a break and the break turned into a nice holiday and since the year began, I haven’t had enough will power to start blogging again. I have been procrastinating, endlessly and anyway it has been so cold over here (our temperatures reached -25°c today (-13F). Anyway, I’m glad I’ve finally planted myself on a chair and managed to write this brief paragraph. I hope the next post will be longer. How was your Christmas break? or shall I say December break since we don’t all celebrate Christmas. I hope you all had a wonderful time with your families, colleagues and friends and I sincerely wish you all the best of 2014. I did have lots of time to think clearly about my New Year resolutions. I hope you did too. For me, it was mostly about the direction I want my blog to take…lots of exciting things, if they can be implemented? Assemble all ingredients before you start. Preheat the oven to 310°F (150°C). 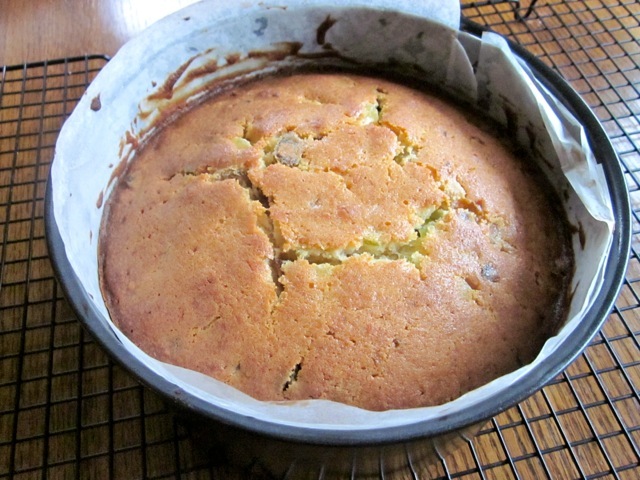 Line the base and sides of a deep 20cm (8 inch) round cake pan with two layers of parchment (greaseproof paper). Sift flour and baking powder, set aside. 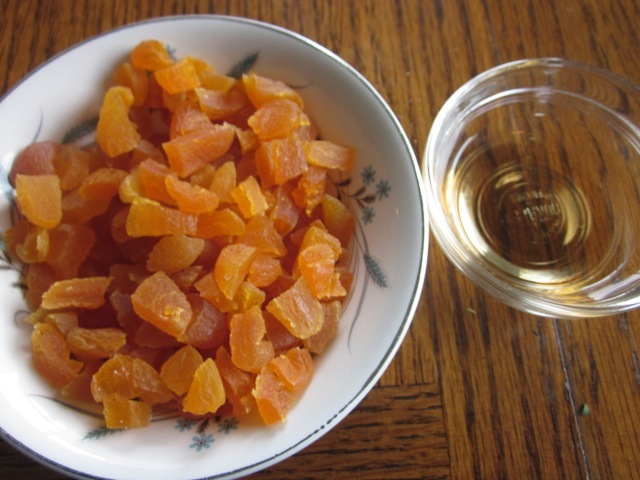 Pour 1 tablespoon sherry over the apricots, mix thoroughly, and set aside for at least 30 minutes. Drizzle honey over dates, set aside for at least 30 minutes. 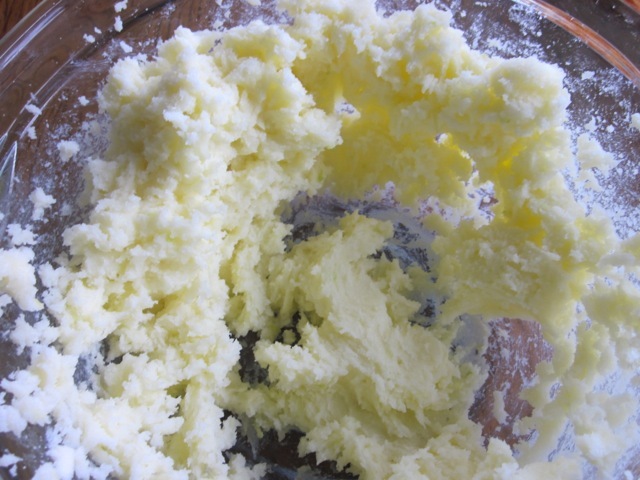 Cream butter, rind (zest) and sugar until light and fluffy. Beat in eggs one at a time. Beat until thoroughly combined. 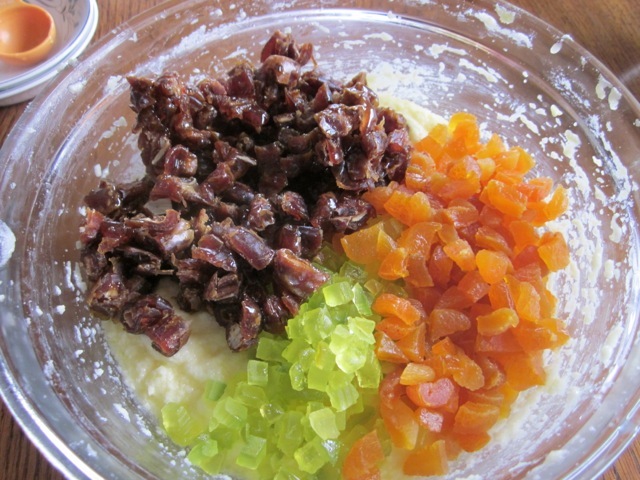 The mixture, after stirring in dates, apricots and candied peel. 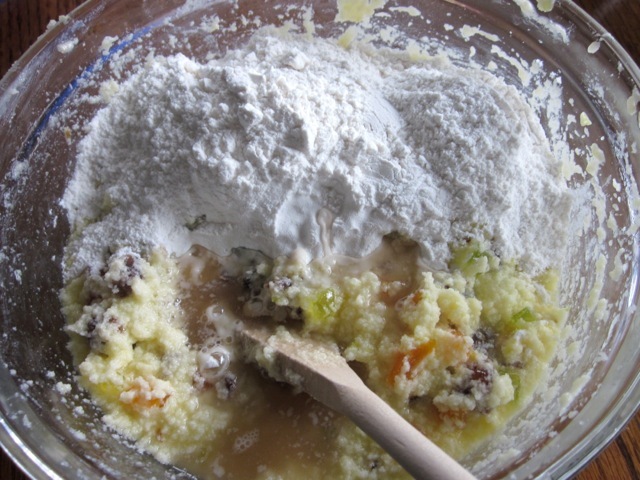 fold in half sifted flour and half the extra sherry then fold in the remaining flour and remaining extra sherry. Spoon the final mixture into prepared tin and bake for 1½-2 hours until golden or until a skewer inserted in the middle comes out clean. (I baked the cake for 1hour 45 minutes at 310°F (150°C). Remove cake and let stand for 5 minutes, then cover with foil while still in tin and leave to cool completely. If you like you can spoon 1-2 tablespoons sherry, evenly, over the cold cake for the next few days. 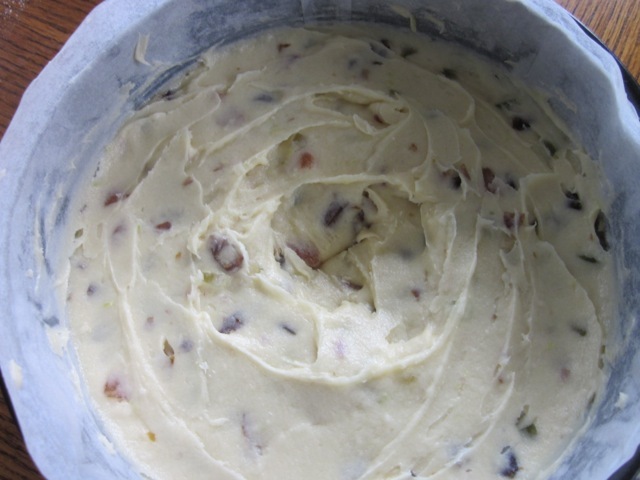 The cake can keep for 2 weeks in an airtight container. 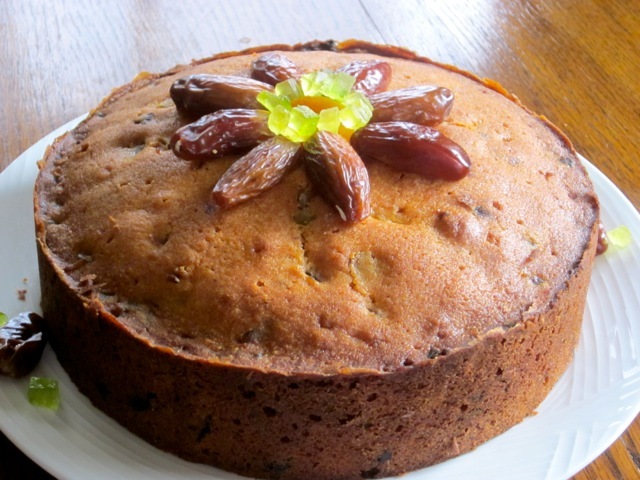 I decorated the cake with some dates and candied peel. I had a slice a day for a couple of days. I hope you enjoy it too. Preheat the oven to 310°F (150°C). Line the base and sides of a deep 20cm (8 inch) round cake pan with two layers of parchment (greaseproof paper). 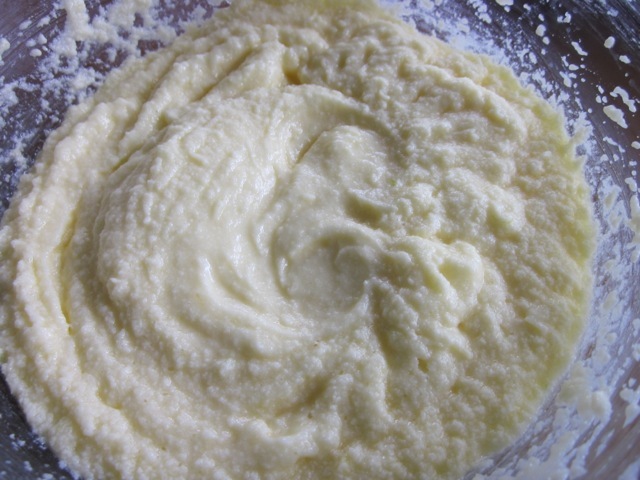 Sift flour and baking powder, set aside. Drizzle honey over dates, set aside for at least 30 minutes. Pour 1 tablespoon sherry over the apricots, mix thoroughly, and set aside for at least 30 minutes. 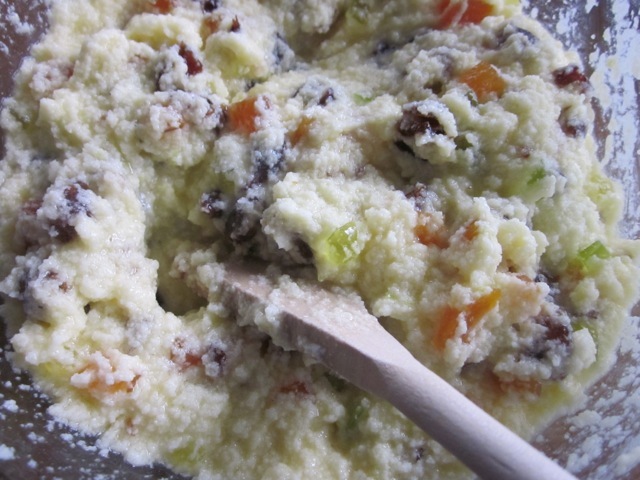 Stir in dates, apricots and candied peel, and then fold in half sifted flour and half the extra sherry. 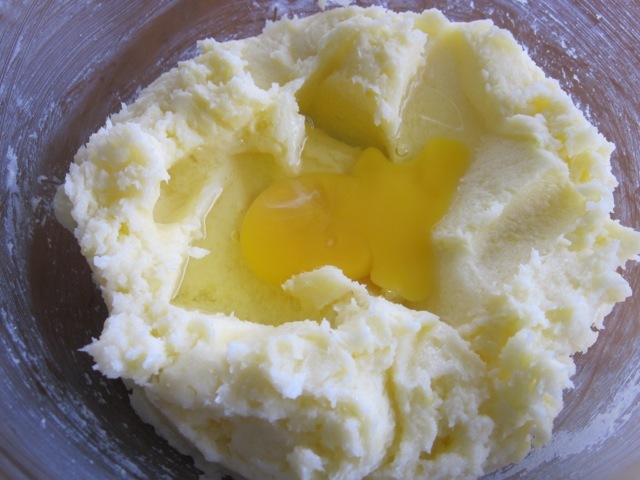 Fold in the remaining flour and extra sherry. 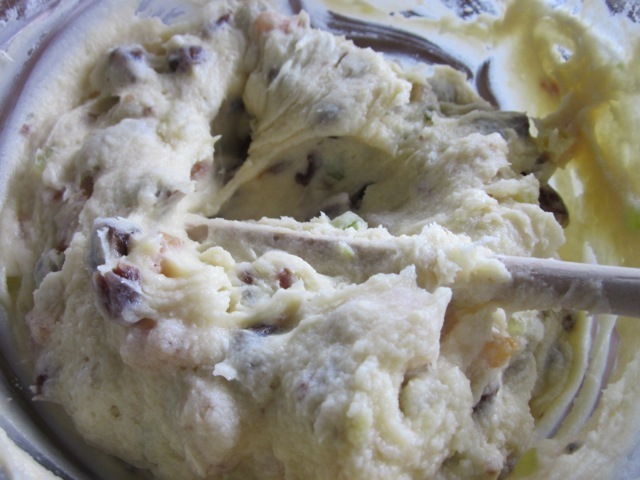 Spoon into prepared tin and bake for 1½-2 hours until golden or until a skewer inserted in the middle comes out clean. Remove cake and let stand for 5 minutes, then cover with foil while still in tin and leave to cool completely. 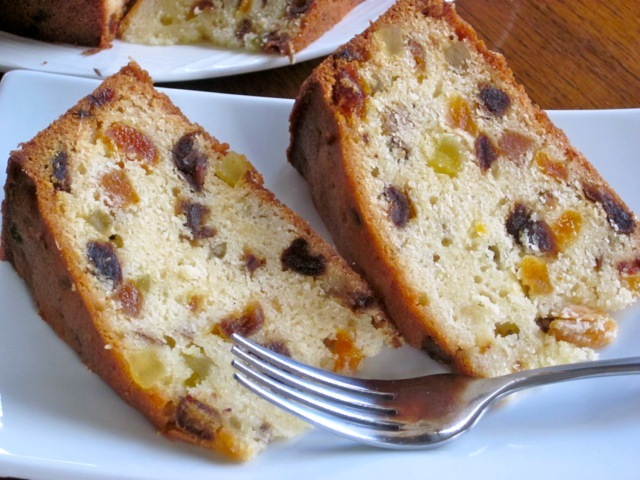 If you like you can spoon 1-2 tablespoons sherry, evenly, over the cold cake for the next few days. The cake can keep for 2 weeks. Please note that oven temperatures are given as a guideline only. You may need to add or reduce the suggested temperature depending on your oven. I baked the cake for 1hour 45 minutes at 310°F (150°C). Liz, my wife made this for me at the weekend and it is STUNNING!! Everyone should make this. Fabtastic. Best cake I have tasted for years! You are a genius!! I am over the moon…Keith. I am so glad you wife made the cake and you found it stunning. I love this cake. When I bake it, I drizzle some sherry on top for about three days then I start enjoying it, one slice a day until I grudgingly finish it. Thanks so much for the feedback. Enjoy the rest of the week! Ha ha Marsala is fine too. I’m so glad you liked it. Next time try drizzling. Have a wonderful end of week! Happy New Year Liz! Hope you had a vacation! 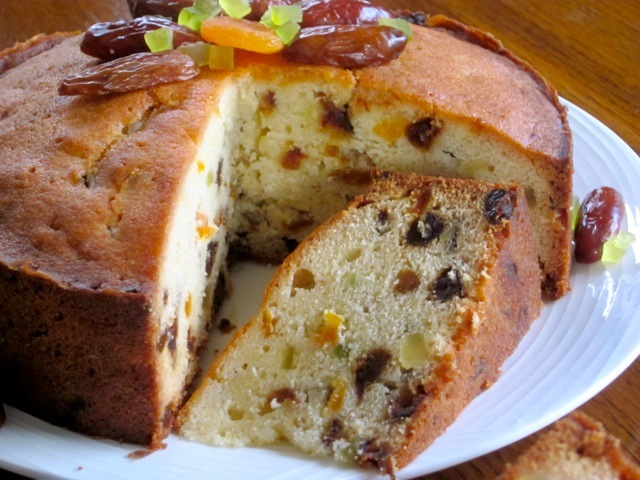 The cake looks delicious and so colourful with all the dried fruits. Thank you for complimenting. Wish you a wonderful week. Beautiful fruit cake Liz! Looks very professional, which I can never get my cakes to look like. Welcome back! Thank you for the kind words. I hope you had a wonderful holiday season. Welcome back too! Nothing wrong with a nice break, but great to see you back. Blogging does seem like a second job at times. Have a great day. I am so happy to see you. Happy New Year. I’ve missed your humorous comments…welcome back. Blogging IS A SECOND JOB..LOL. Have a wonderful week! Omg Ralph, It’s so good to see you. I hope you had a wonderful time during the December holidays. Thanks for welcoming me back. I missed you too. Have a wonderful weekend and wish you a lovely 2014 full of happiness and laughter! Thanks Ralph. Enjoy your weekend! Welcome back! Although I missed your posts, it is a good thing to take a break. And what better time than winter when nature goes to sleep. Wishing you a wonderful year! I missed you too. I’m so glad to see you again. I also wish you a fabulous year. I shall have a peek at your blog right now!!! see what I get when I don’t keep up. You got some GOOD stuff on here! Thanks for the compliments and have a lovely weekend. 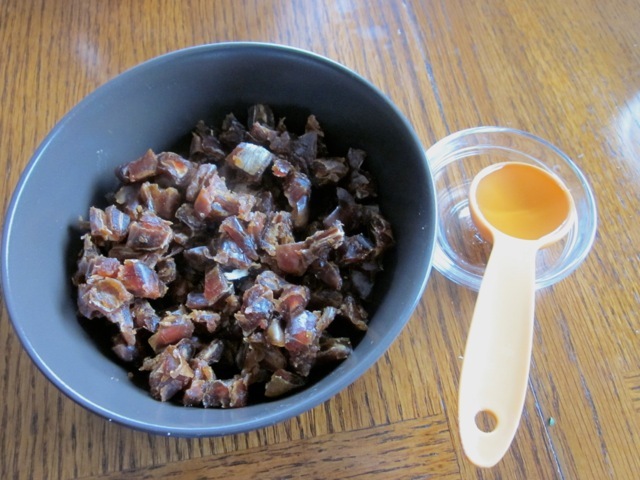 I also love dates and olives…. Happy New Year Liz! The cake is wonderful! Thank you so much for complimenting. Wish you a fantastic 2014. I was still admiring the bean soup. Looks very tasty! Best wishes! Hi Liz! Thanks for liking my posts…. I’m new to the blogging concept and are having fun with my cakes and love seeing new things from others like yourself. Hope you have had a lovely New Year, all be it very cold by the sounds and look forward to following your progress in 2014! Thanks for visiting me and welcome to the WordPress blogging platform. Don’t worry about being new just make sure you post on a regular basis (at least once a week) would be nice. Soon you’ll meet many blogging buddies. I wish you all the best in blogging and the best of 2014. I will definitely take your advice in the posting timely and just so you know you are my first blogger I’m following. I look forward to trying out some of your winter recipes come June when we hit winter, especially the sweet potato scones. Thanks Joanne. I also look forward to following your posts and hope you enjoy whatever you get to try from my blog. I wish you a happy blogging and a wonderful weekend! This looks absolutely delicious, really lovely and moist. Thanks for sharing. Happy new year to you! 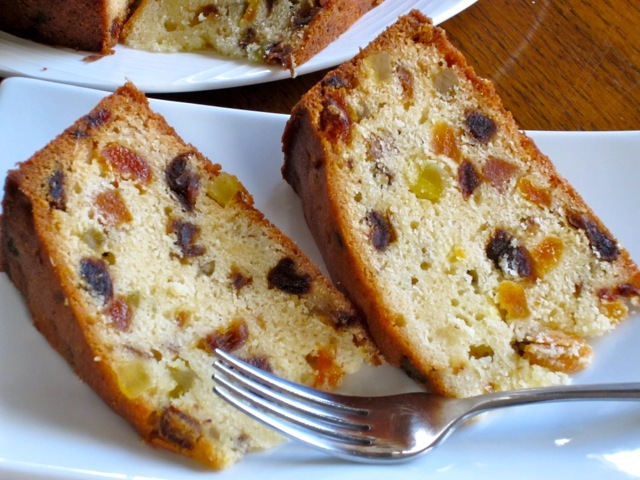 Lovin dried fruit cake all the way…. Happy New Year and thanks for giving me a good laugh. Maybe she added so much sherry they decided to sink? I wonder why but I hope you enjoyed eating them all the same. Have a lovely weekend! Happy New year and thank you for complimenting!!! I love cake too. Enjoy your weekend! Had a lovely relaxing December break! One of the best, no stress ,hoping this year will follow suit. Great recipe by the way! I am so glad to hear you had a stress-free and relaxing December. That’s the way to go. I wish you a happy and relaxing 2014 too. Enjoy your weekend! Thanks… Things seem to be getting more calm around here as my 4little ones are getting bigger… Not yet teenagers so I’m sure it might get crazy again in the not so distant future! Ha ha I’ve 13 and 15 year olds. Things are good so far. I hope the’ll be 20 soon…have a great weekend! We ate lots of fruitcake. I really love them with lots of sherry or brandy..yum. I’m looking forward to a wonderful 2014. Hope you are too. Best wishes and enjoy your weekend. Glad to see you back Liz! I know how difficult it can be to get back to blogging after a short while off. Hope you had a wonderful holiday season and wish you all the best in 2014. I look forward to watching the changes you make to the blog. I am glad to see you too. I missed you. I had an awesome holiday season and I look forward to a great 2014. I want to stay positive. Ha ha most of the changes will be content wise. Have a lovely weekend! Liz, the cake looks marvelous! I missed you too and wish you a wonderful 2014. Take care and keep in touch. Have a wonderful weekend! Missed you too. I had a long nice and refreshing break. Hope you did too. Wish you the best of 2014 and hope the daughter does some baking. Best wishes, Keith! So pleased to see your post today. You are missed! I’m sorry to hear about all the cold weather while I’m enjoying wearing shorts, sleeveless tops and flip flops. However, it did rain all day today so it has.temporarily cooled things off a bit. 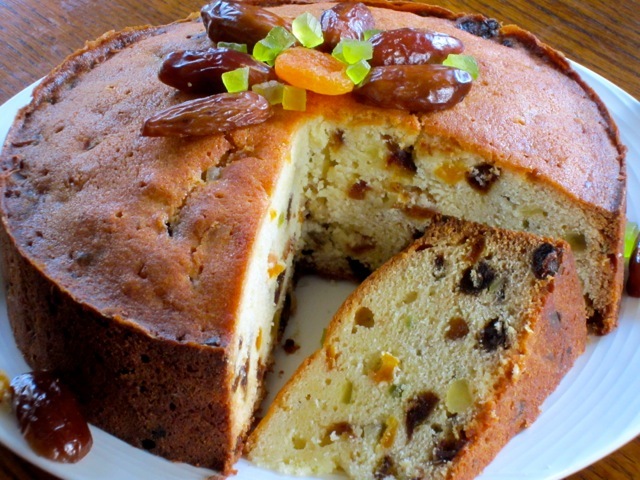 I may be in a minority, but I love Christmas cakes…fruit cakes. They are such good keepers and stay nice and moist. Cheers for now! I am so glad to see you. I’ve missed you too. Omg I envy you and the warm weather. If wishes were horses, I would be right there beside you in the most colourful flip flops ever! 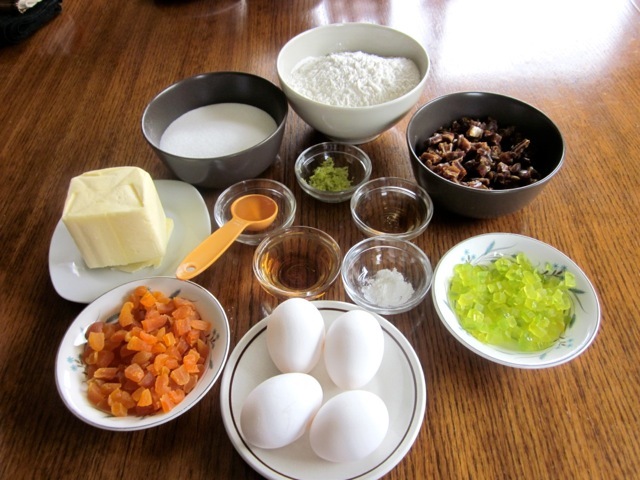 I adore fruit cakes (homemade with tender loving care). I wish you all the best of the holidays and a wonderful 2014. Welcome back! I was a little worried about your absence. Happy New Year!!! As a New Year’s gift, I would like share my favorite quote. whether we talk too many words without any pause. Happy New Year Jessie. I am so glad to hear you worried about me. At least I know there are people with caring hearts out there. Thanks so much for sharing your lovely and thoughtful favourite quote. I’ve enjoyed reading through it and I must say I shall remember to give it a PAUSE….I had a fantastic beak and I look forward to a wonderful 2014. I wish you a prosperous 2014 and a fantastic weekend. Hey Liz… Cake looks delish! Welcome back to the blogging world! Happy New Year and thanks for complimenting. I wish you a fantastic 2014. Have a lovely weekend! your cake look so yummy! Hey Liz, Happy New Year to you too! Good to see you back! Your cake is gorgeous and a perfect start to a new year. As always your photos are exquisite! I am glad to see you too. Wish you a wonderful year! Thanks, Amal. I shall remember next time. Have a lovely pseudo laden weekend! What a great way to kick off the new year with this post and your beautiful photographs! Your cake is lovely and the finished presentation with the garnish is so pretty. It’s great to have you back with us! Thanks so much. I love your blog and photos too. I wish you a wonderful weekend! Funny…I was just wondering last night why I haven’t seen any new recipes from you. Welcome back from holiday! Hi Liz–welcome back! I was just thinking about how I missed your posts the last month and to my delight you came back today and with such a delicious recipe too! I wish you a happy new year and hope your holiday was fabulous! Liz, Happy New Year 2014! I saw this cake on you Facebook and had to come here immediately to check it all for feast to the eyes and yummy for the tummy! Happy New year and as usual thanks so much for always supporting me on Facebook. It’s so kind of you and I really appreciate your time and effort. Thanks so much for complimenting. Wish you the best of 2014. Happy new year! You got me worried! Was wondering where did u vanish :)… I am so glad to see you here:). Happy New Year. Thanks so much for worrying about me…how lovely of you. I am so glad to see you too. Thanks for complimenting and wish you a wonderful 2014. Best wishes! Happy New Year. Thanks for complimenting. I enjoyed eating the cake. Best wishes! Happy New Year to you too, and thanks for all the kind words and all the lovely compliments. It was sure difficult to start, again. I’m so glad I managed to do it today. I wish you a Happy and Prosperous 2014. Best wishes!